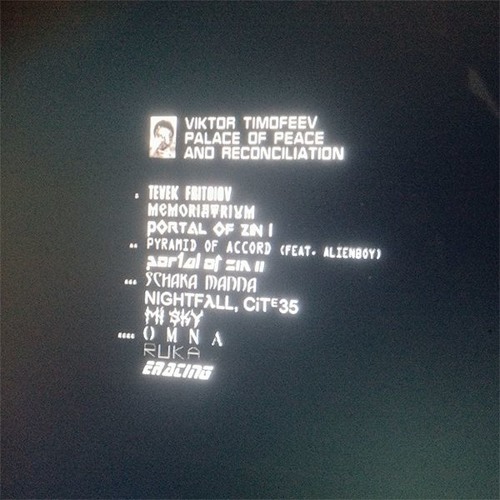 Palace of Peace and Reconciliation started as a collection of recordings released on cassette in early 2013. It evolved into a series of pop-up exhibitions of collages, animations, zines, special recipe meal and drink and musically based performances from Viktor Timofeev, Recsund, Simon Werner, Nada (of Sun Worship) and Bryce Hackford, Hosted at Fitness in Bushwick, Brooklyn, Kanepes Kulturas Centrs in Riga, LCBP A-Float during Frieze, L.E.A.P. in Berlin and concluded with an exhibition at Arcadia Missa in London in February 2014. To coincide with the final exhibition an artist edition vinyl, cd-r and zine was published by Lobitlandscapes, available to purchase at the Arcadia Missa online shop. the zine contains contributions from Stephan Backes, Cindie Cheung, Maria Gorodeckaya, Kaspars Groševs, Bryce Hackford, Emily Jones, Chris King, Paul Timofeev, Simon Werner, Lawrence Lek, Dasha Melnikova, Alex Rathbone, Clifford Sage, Camila Sotomayor and Takeshi Shiomitsu, responding to recordings from the original cassette.